Medium cherry colour. Aromatic nose of lavender, allspice and subtle toasty oak. Rich, dark cherry flavour on a sweet mid-plate, with a fine line running through it from front to back. Fine, even, powdery tannins and a long, balanced finish. An elegant style with deceptive complexity. Notes provided by Spring Vale. In October of 1826, William Lyne, his wife and five children arrived in Van Diemen's Land. Among the first of the settlers in Tasmania, the Lynes gave names to features of importance to them, such as Christmas Point, at which they arrived on Christmas Day. Early life in the area held its fair share of challenges, which the Lynes and other pioneering families rose to meet. The result is a richly interwoven history of innovation, struggle and achievement for the area. The Spring Vale vineyard is situated at Cranbrook, north of Swansea on Tasmania's East Coast. 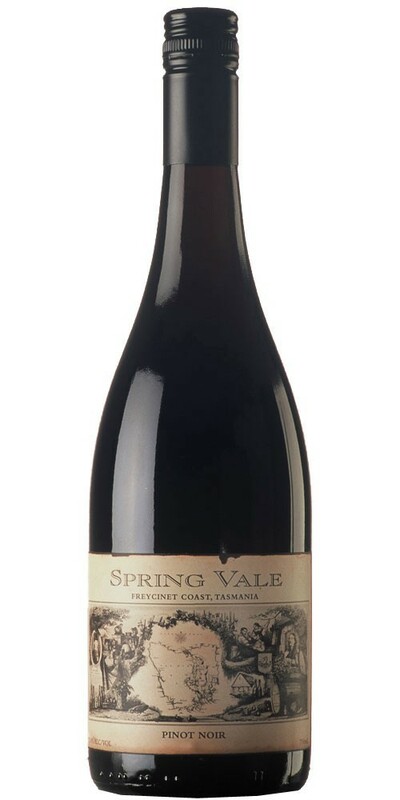 Continuing in the tradition of hard work and innovation established by William Lyne in 1826, Rodney and Lyn Lyne have planted 6.6 hectares of wine grapes at Spring Vale; the vineyard officially founded in 1986. The Lyne motto, featured on their family seal is "Aperto vivere voto." This means "to live life as an open book; to live as an honest person" also relevant to their winemaking philosophy and natural style. What you taste is achieved using grapes grown in a special part of the world.